Picture this: you’ve purchased your first electric skillet and found the perfect spot to store it in your kitchen. Congratulations! A whole world of cooking opportunities is now available to you! But wait--what can you cook in an electric skillet? If you’re not sure which recipes will suit your electric frying pan best, that’s where we come in! We’ve compiled an enormous list of 67 electric skillet recipes for various occasions and preferences. You’ll be cooking up a storm before you know it! Who doesn’t love meatballs? 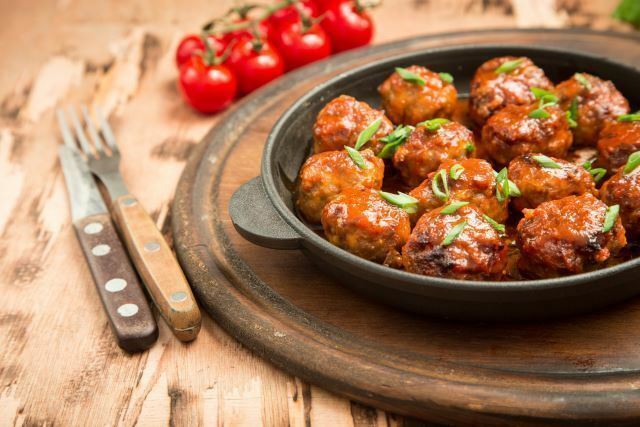 Not only are meatballs versatile and filling, but they are a crowd pleaser for nearly any event. This particular meatball recipe captures the delicious contrast of sweet and sour. We absolutely love how this recipe only uses a few ingredients with super simple instructions for easy but tasty meatballs. Just mix it all together, form the balls, and they are ready to cook in your electric skillet! Have you ever had crostini? It is often confused with the traditional Italian garlic bread bruschetta, however, there are differences. 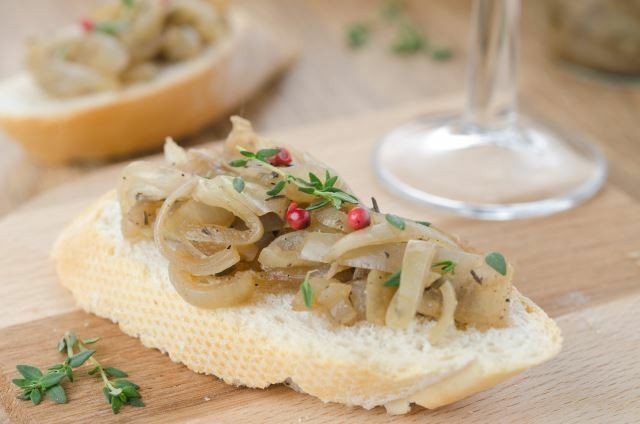 Crostini means, “little toasts” in Italian, as the appetizer features small slices of toasted bread, brushed with olive oil and topped with savory ingredients. This particular recipe not only uses the electric skillet to toast the bread but also to cook and soften the toppings! 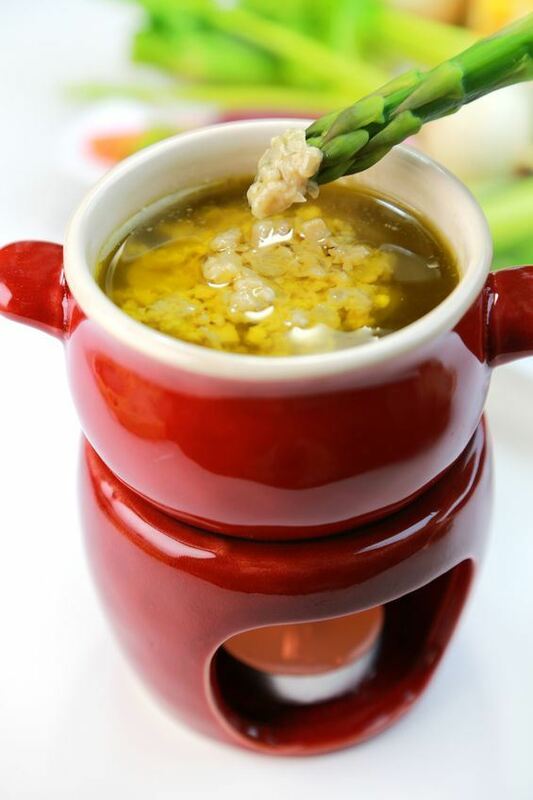 Bagna Cauda is a traditional Italian dip. The appetizer is delicious for dipping raw vegetables, as well as crusty pieces of bread. This recipe combines butter, garlic, and anchovies for a savory dip cooked right within the electric skillet. Have you considered frying homemade bread in your electric skillet? This recipe takes you through the steps of preparing a cheesy garlic topping, spreading it over some brioche and frying them up in the skillet. The bread would be a delectable appetizer, especially when accompanied by the Parmesan topping mentioned in the recipe. Nothing quite beats apple pancakes. As kids, we grew up requesting apple pancakes for lazy weekend breakfasts, and they rarely fail to satisfy! 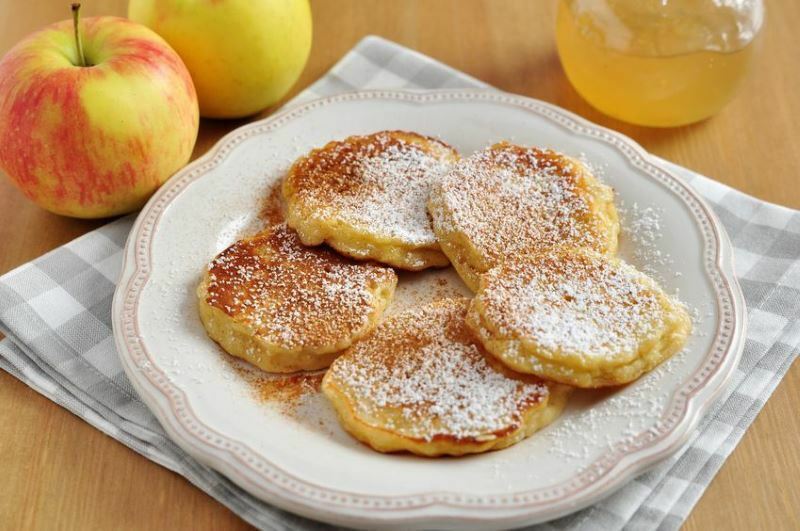 To make pancakes even easier, this recipe shows you how to make apple pancakes in your skillet! The skillet is meant to help them cook evenly for fluffier pancakes than stovetop. The surface area of the skillet may also create greater ease when flipping the pancakes. Have you made potato pancakes? Most of us have at least tried them at some point in our lives, and they certainly are a classic, homestyle brunch food. 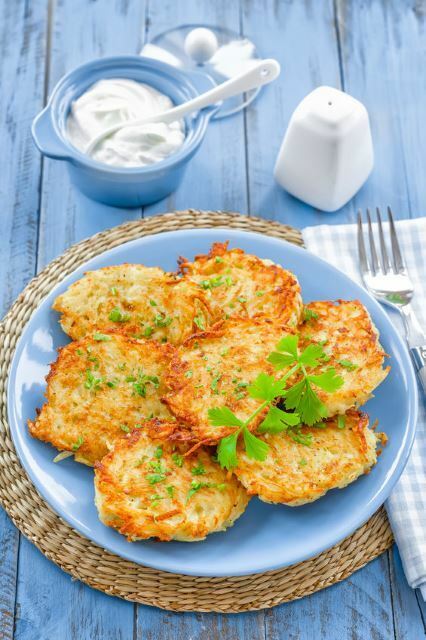 The steps are simple with these potato pancakes: simply grate the ingredients, squeeze out any liquids, mix them together and form the patties. Finally, use your electric skillet to fry a few at once! Ahh, French toast. The breakfast that many of us grew up loving and still adore to this day. Yet, it can be rather a hassle to cook each slice one at a time on the stove. Not only does it take longer than we’d like, but the first slices are cold by the time the last slices are cooked. 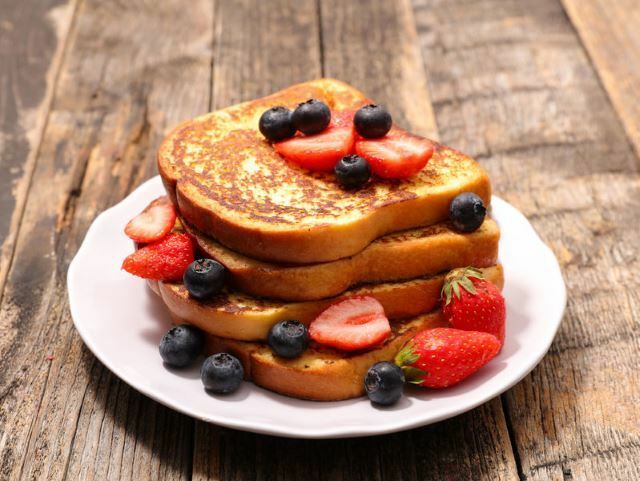 This recipe changes that with cooking multiple slices of French toast at once in the electric skillet! Eggs often make for the perfect weekend breakfast or brunch. Additionally, adding a nice serving of veggies is refreshing and provides multiple vitamins. This recipe combines the best of both worlds with first sauteeing veggies until soft and adding in eggs for a tasty breakfast. 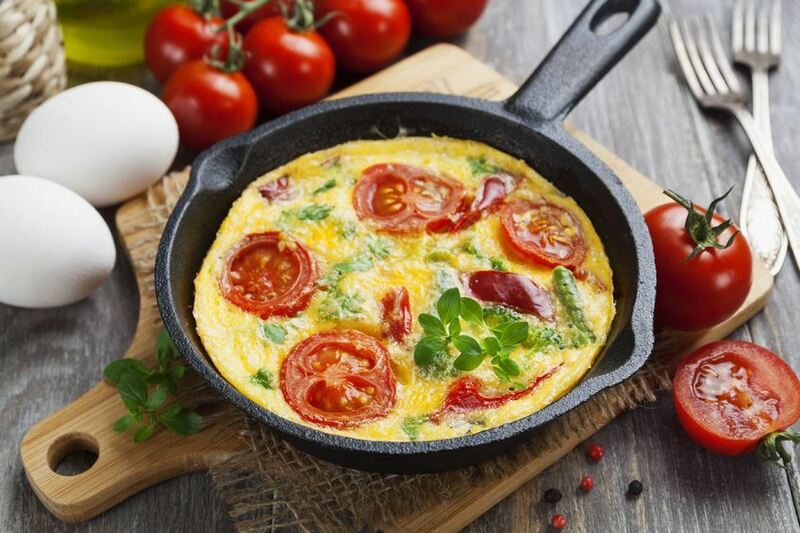 If you’ve never had a frittata before, then you are in for a treat! Frittatas are basically a crustless quiche. If you like quiche, you’ll love this! 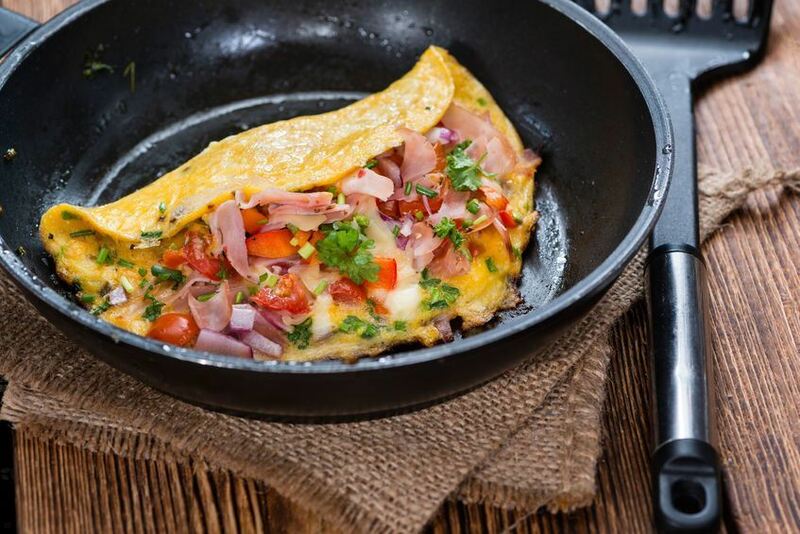 The recipe begins by melting butter in your skillet, followed by adding in veggies until soft, and finally pouring in the egg mixture with cheese, meat and seasonings. All that’s left is for your electric frying pan to bake it! 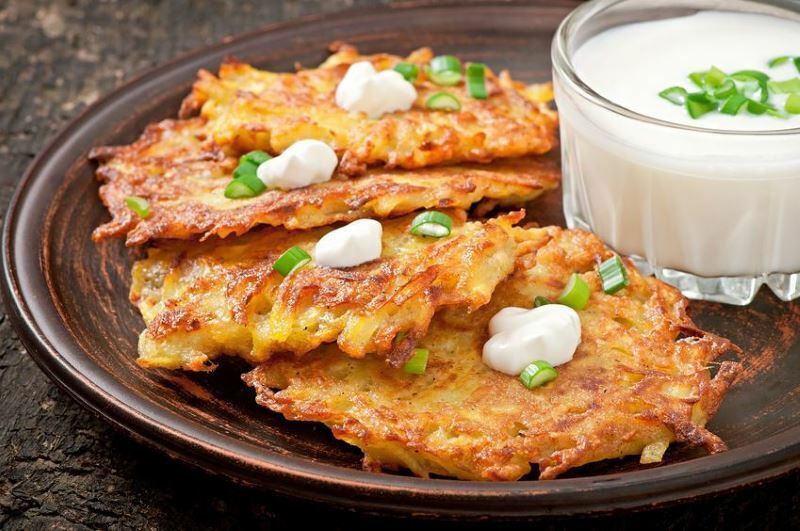 These potato pancakes look mouth-wateringly delicious! The pancakes are made of buttery mashed potatoes rather than grated, and includes garlic and green onions for extra flavor! Once the pancakes are formed, they are fried on both sides in the skillet until golden brown and crispy. Do you like Indian food? 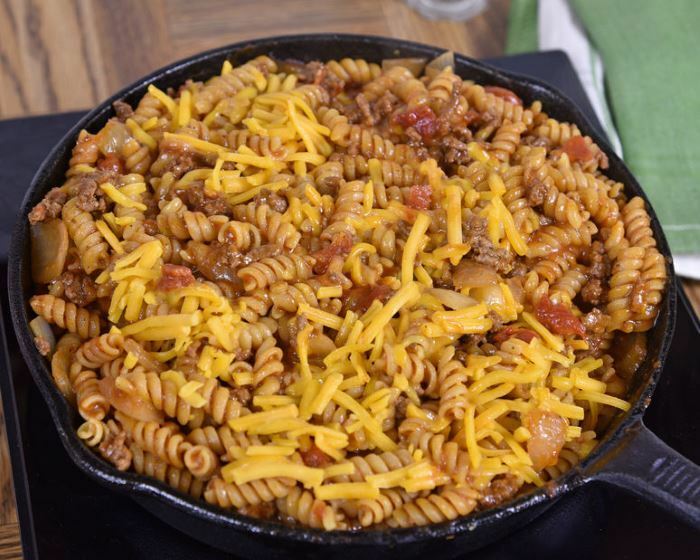 This looks like an amazing one-skillet meal if you do! With the combination of traditional Indian spices such as ginger, turmeric, and cumin, this dish is bound to be bursting with flavor. The recipe looks quite easy as well with first cooking the vegetables in the skillet, and then adding everything else and cooking until done. That’s it! For those of you who love your chicken enchiladas, there is definitely a skillet option for you! This recipe is so fun because it takes something that is typically an oven-only dish and turns it into something that can be transported right to the tabletop for convenience and keeping it nice and warm. 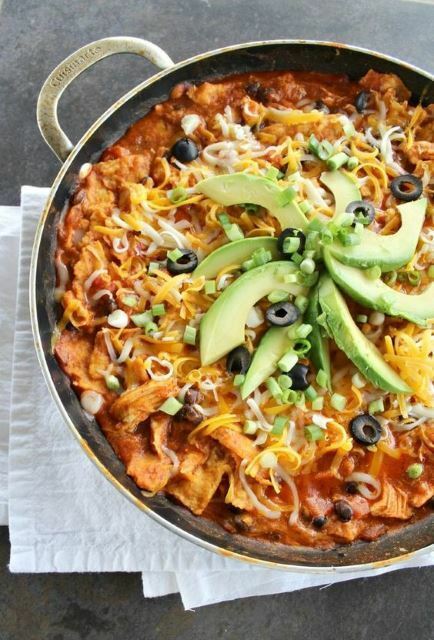 This is an easy recipe utilizing bite-sized tortilla pieces for the enchiladas and all the other ingredients are simply added to the skillet nearly at once to cook and flavor together. Have you ever wished you could just cook all of your spaghetti in one dish for easier cleanup? Now you can with your electric skillet! Spaghetti is an easy, go-to recipe as it is, but this recipe takes it one step further with condensing the whole process into one pan! Simply brown your meat in the skillet, then add your other sauce ingredients, and finally toss in broken spaghetti noodles to boil in the same dish! Thanks to the depth of electric frying pans, you only have to wash one pan tonight. Kielbasa and onion are a delicious combination any day, but throw in some pasta and tell me it’s a one-dish meal and I’m sold! This recipe does exactly that with cooking everything in your electric skillet. Not only does this minimize dishes, but all of the ingredients flavor each other as they cook together. The recipe first calls for cooking the onions and kielbasa and then adding the sauce ingredients and pasta. The pasta cooks right there in the sauce for a delicious turnout. 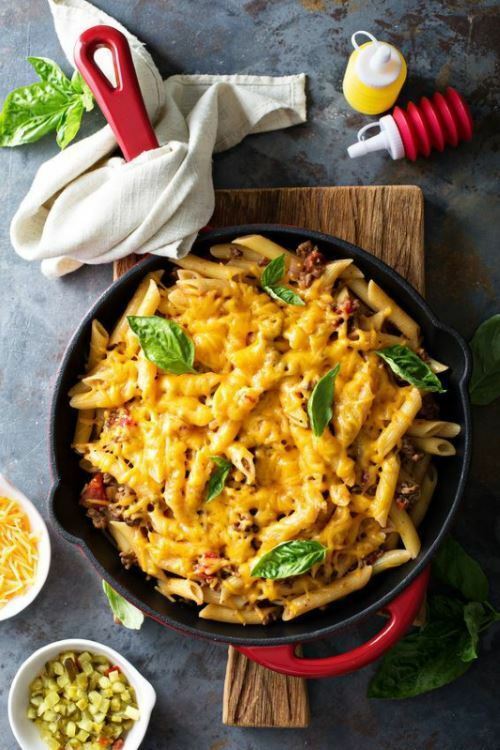 We just can't get enough of all of these electric skillet pasta recipes! Baked Ziti is a beloved dish all around, and now you can make it in your very own electric skillet. Simply cook the meat, then add the sauce and pasta, cooking until done. Finally, add the cream and cheese, and serve when it’s melted! Voila! 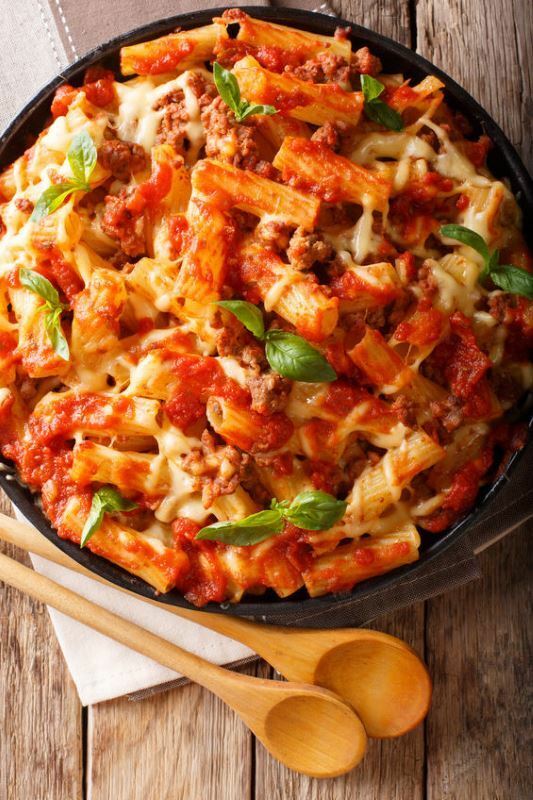 The easiest Baked Ziti you’ll ever try. Did you know it’s possible to make fudge in your electric skillet? Just the thought of making fudge is neat, but how cool is it that you can make it in your skillet?! This recipe not only sounds delicious, but it seems pretty easy, which is always a win in my book! Simply mix, melt, and boil the ingredients. 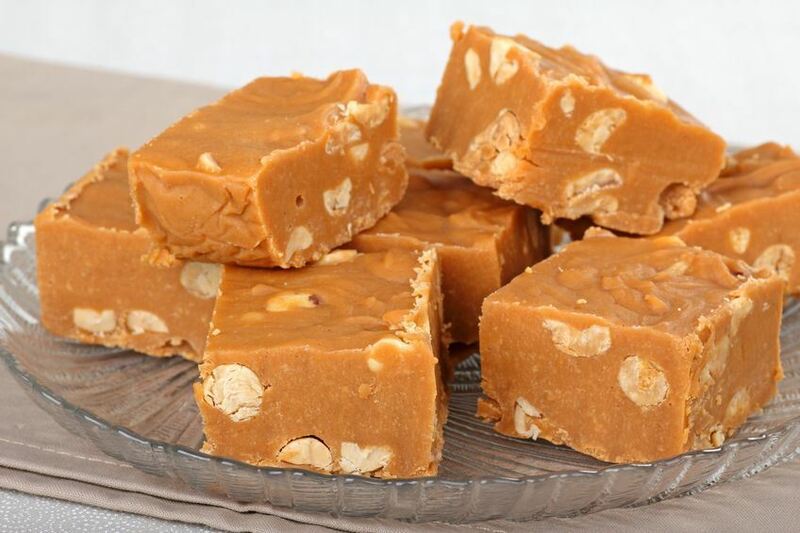 This is another fudge recipe, though it’s specifically for a creamy peanut butter fudge. Per the author’s notes, this particular fudge recipe has been tested by time, perfected, and made countless times over the decades between her and her mother. While it is a peanut butter fudge, it can also be made into chocolate and cuts the wait time associated with traditional fudge. Throw some extra peanuts in and go to town! Cookies in the skillet?! Absolutely! If you can bake and cook other food items, why not cookies? This is a wonderful option if you have a craving for cookies, but it just seems too hot to heat the oven, or you’d merely rather conserve energy. These cookies are rolled out, added to the skillet, and flipped during the cooking/baking process. It helps to keep them covered for even cooking, which is one of the perks of your electric skillet! You can even bake a cake in an electric skillet! If you’re using a boxed cake mix, you’ll begin by mixing the batter together as instructed while your skillet is preheating. Though this recipe is specifically for a cake mix, we believe it would probably work just as well if you made the cake batter from scratch. Once the skillet is preheated, pour the batter in, cover it, and bake as directed in the cake instructions. For timing, use the cooking guide according to a baking pan slightly smaller than your skillet. Let the cake cool thoroughly before inverting onto a platter. We absolutely love the idea of baking a pie in an electric skillet! Why not, right? It’s perfect for those summer days when you need a pie for a holiday or event and yet, the last thing you want to do is heat your oven. This recipe is pretty neat because it basically just calls for using the skillet as a heating element. 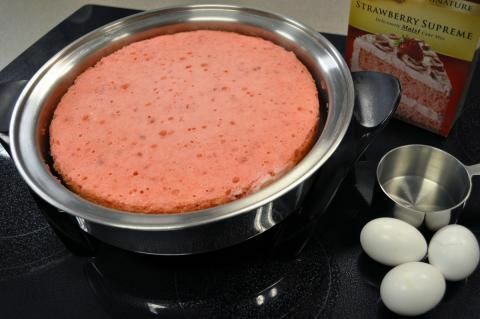 You’ll assemble an easy-peasy pie within a cake pan, and then simply set the cake pan in the skillet to bake! Have you heard of Piaya? It is a sweet bread served for dessert or possibly even just a sweet snack. Piaya has a filling made from muscovado sugar, which can be refined or as unrefined as the dark brown sugar in molasses. This recipe calls for mixing the dough together, cutting out the bread rounds, drizzling the sugar mixture in the centers, sealing them, and frying them in the skillet until browned and crispy. This recipe for cornbread in the skillet is unique because just like with the pie recipe, it utilizes the skillet as a miniature oven. I love this idea for saving energy when you’re only baking something small. For this particular cornbread, simply put together your mix as usual, and pour the batter into a baking dish. This recipe recommends placing the baking dish on a rack inside the electric skillet to avoid burning the bottom. Pour batter into a greased baking pan (a 9” circular pan works well in a 12” e-skillet) that fits loosely in the electric skillet and place on a low slotted or perforated rack to prevent burning at the bottom. Cover with the lid and cook at 375°F for 25-40 mins. (depending on your electric skillet) - you’ll know it’s ready if you insert a toothpick and it comes out dry. This looks like a delicious recipe for frying fish in the electric skillet! It calls for some kind of mild white fish, presumably cod or tilapia. 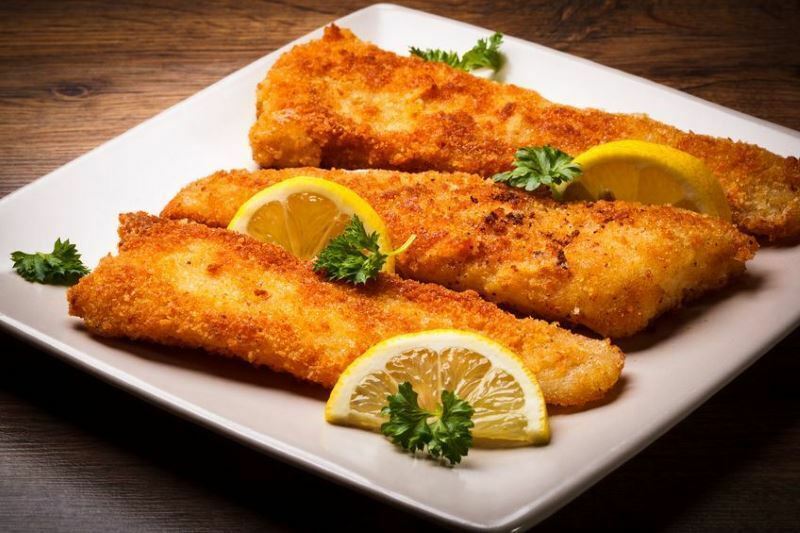 The recipe recommends using a beer batter to fry the fish for extra flavor, but it also gives the option of using water if you’d prefer. These fish will be nice and crispy with just a few steps of flour, egg, and breadcrumbs before frying them in a couple inches of oil. Nothing quite says comfort food like a delicious pasta dish. The best part about this pasta recipe is that it’s a one-pot meal! Simply brown the meat, then add the water and pasta to boil, and then the sauce and the rest of the toppings. Fast and simple, with easy cleanup! To top it off, this dish is saucy and cheesy--the best part of Italian food! Do you like shrimp? It’s a breeze to cook shrimp in the electric skillet, which this recipe so tastefully demonstrates. If you like Cajun as well, then you’ll be flipping for this! 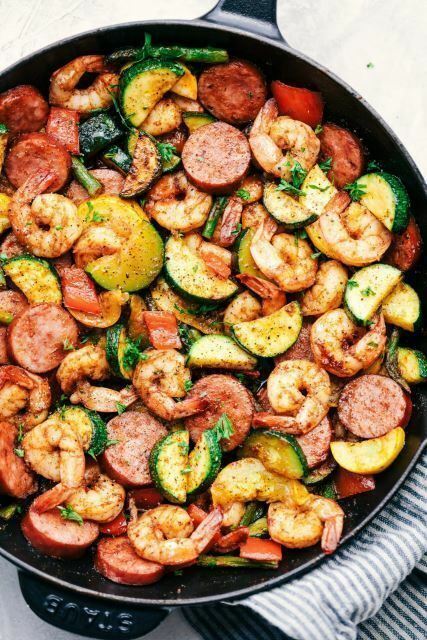 We love that this recipe not only combines the delicious flavors of the shrimp and Cajun, but it also calls for a heaping variety of vegetables! With zucchini, squash, asparagus, and bell peppers, this dish is bound to leave you feeling satisfied and healthy. 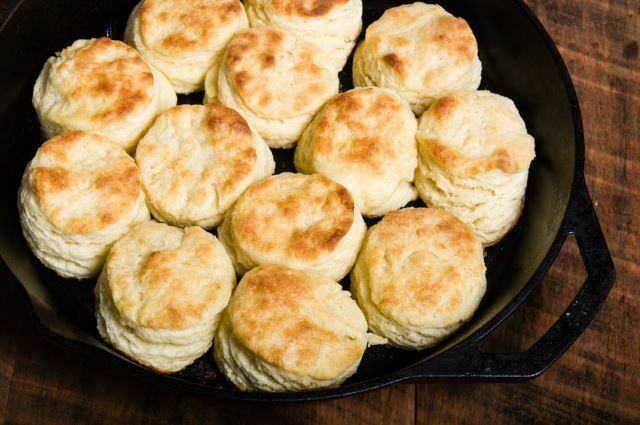 It’s such a great idea to fry biscuits in the electric skillet! Just think of the extra flavor the biscuits would have when they are directly fried rather than baked. 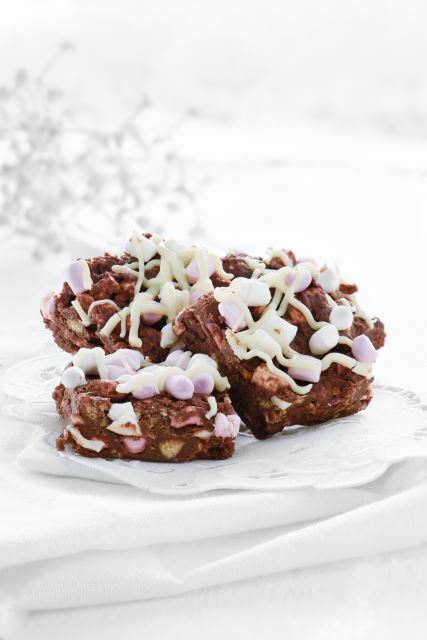 With added crispiness and flakiness, these biscuits are definitely a must-try. As a bonus, the recipe is super simple! All you need to do is add a couple inches of oil to the skillet, drop in your biscuits, and fry them until they are golden brown. Delicious! Is there ever a wrong time for stir fry? It’s hard to believe that something so delicious can actually be healthy, isn’t it? But when you consider the limited ingredients used, with the reduced fats and sugars, it certainly is on the healthy spectrum of food! 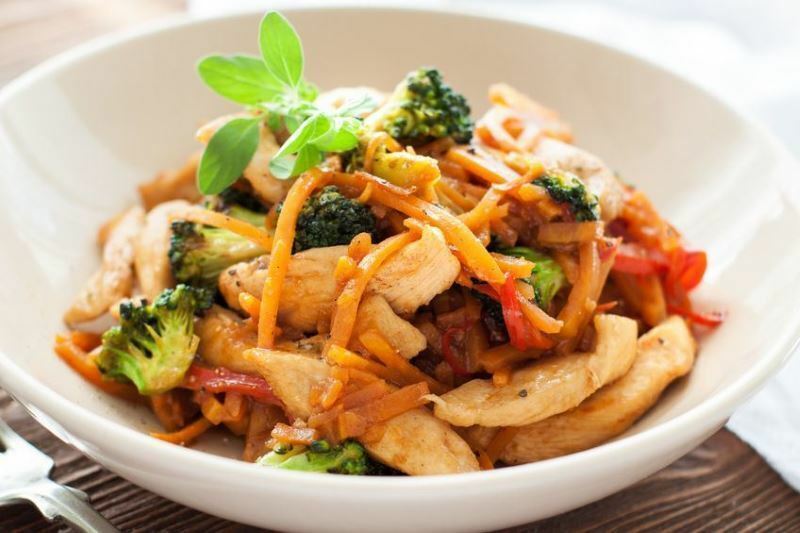 This recipe is one of the easiest for chicken stir fry as it just calls for cooking up bite-sized chicken, throwing in frozen stir fry veggies, some seasonings, and instant rice. If you’re someone who prefers your stir fry on the spicier range of things, this recipe may be perfect for you! Prepare to find yourself in guilt-free bliss with this mixture of ginger root, jalapenos, and other veggies for a sweet and spicy stir fry! This may not be the simplest recipe, but it certainly looks like it would be worth the effort for spice lovers! While the first stir fry recipe was all about minimizing effort, this one is capitalizing on those robust flavors from fresh vegetables. There’s no getting around the fact that fresh vegetables always taste the best. 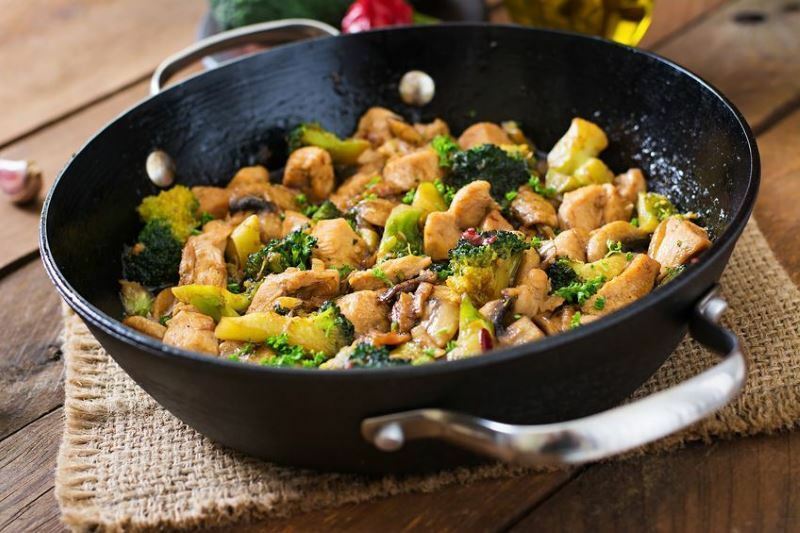 This recipe calls for a variety of veggies such as the broccoli mentioned in the title, mushrooms, green onions, and even ginger. As a side note, if you’d rather skip the spice, it’s probably not a problem to omit the ginger. If you love the flavor and health benefits of grilled veggies, did you know you can just grill them right in your electric frying pan? There’s no need to get a special grill pan or fight the foil wrap for your outdoor grill when you have an electric skillet. Simply dice up your veggies, toss them in the skillet, and leave them for a few minutes until they are done! Perfect for vegetarians! If you like fish tacos, you’ll have to try this fish taco salad! 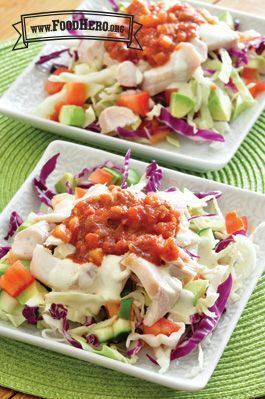 Taco salad is a classic dish, but this recipe takes it up a notch with tastefully-seasoned fish. Simply cook the fish by your preferred method until flaky, and mix cabbage with your choice of vegetables. Toss in the fish and top with ranch dressing and salsa. What a healthy alternative to traditional taco salad! If you’ve ever tried to make traditional BBQ chicken, then you probably know the struggle of the skin getting far too crispy before the inside is even cooked. Electric skillets magically solve this problem! 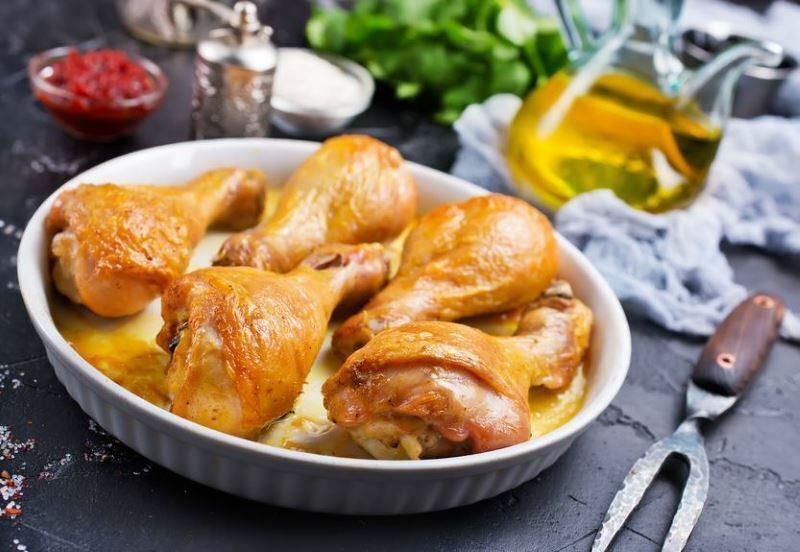 This recipe calls for frying up the chicken in oil until browned and then adding the sauce to cook the rest of the way. Genius! 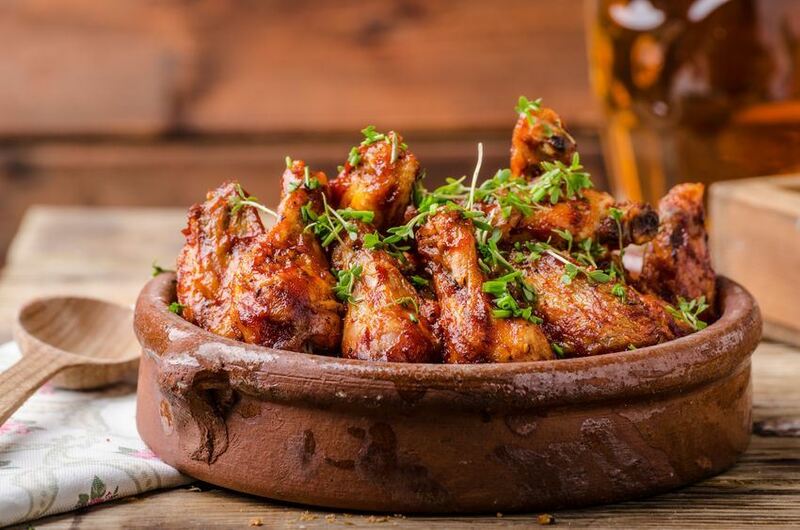 Chicken wings can be tricky to get just right. Even when they have delicious seasoning, they can still end up being dry or tough. This recipe is especially nice because it cuts the need for marinating, which is something that is unfortunately easy to forget. These wings simply cook all at once in the skillet, simmering away covered at first and then uncovered to finish. Frying chicken can be intimidating when you consider the splattering oil. Electric skillets are great for frying chicken because most of them are quite deep, which contains the oil far better than a stovetop pan, and each skillet comes with a fitted lid. Additionally, most electric frying pans can hold more chicken pieces at once than a stovetop frying pan, but of course, this would depend on the size of your skillet. 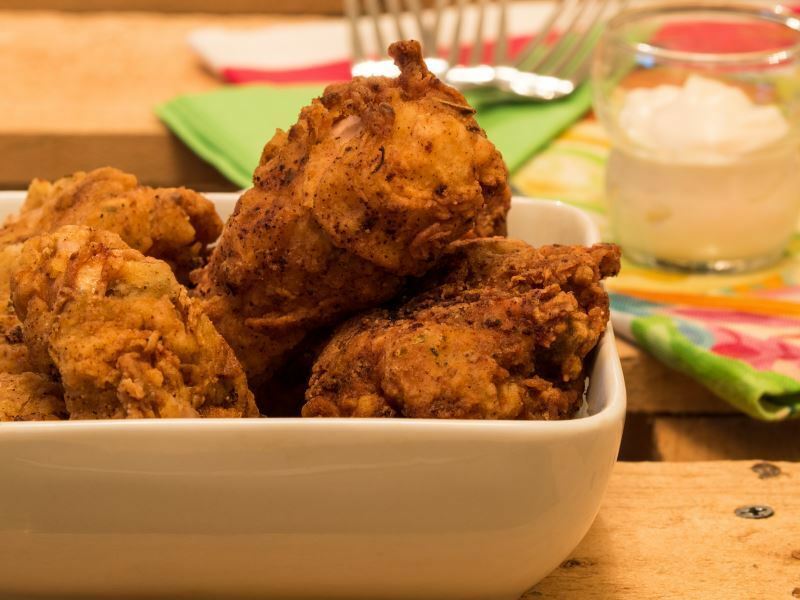 This video demonstrates how to fry battered chicken drumsticks in the electric skillet. Nachos are always a favorite, but how about loaded nachos? 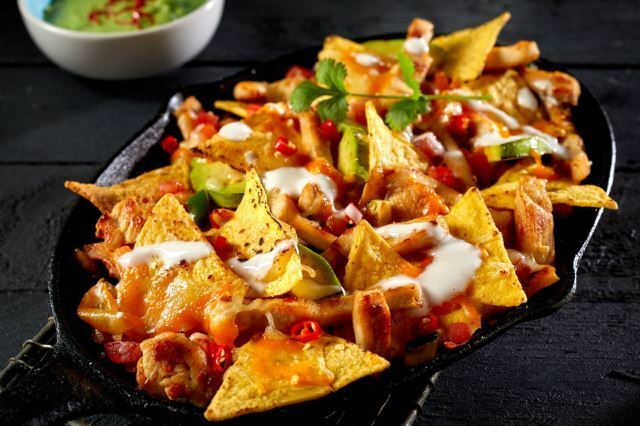 While melted cheese over chips is easy enough to make, these skillet chicken nachos takes it a step further. 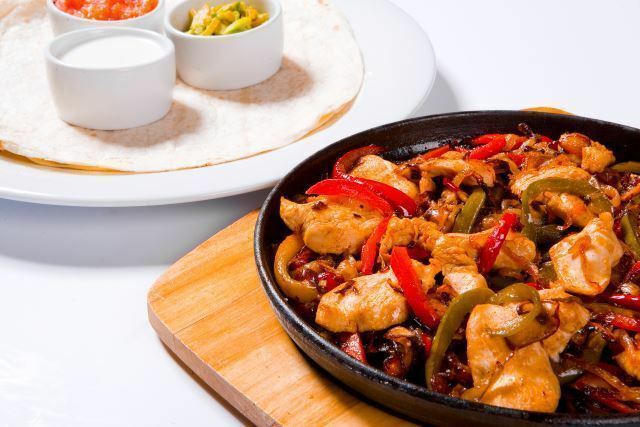 The recipe starts with frying chicken bites in your skillet and then calls for adding sauce ingredients, such as taco seasoning, tomato sauce, bell pepper, beans, corn, and cheese. Once melted, just spoon over chips and enjoy! 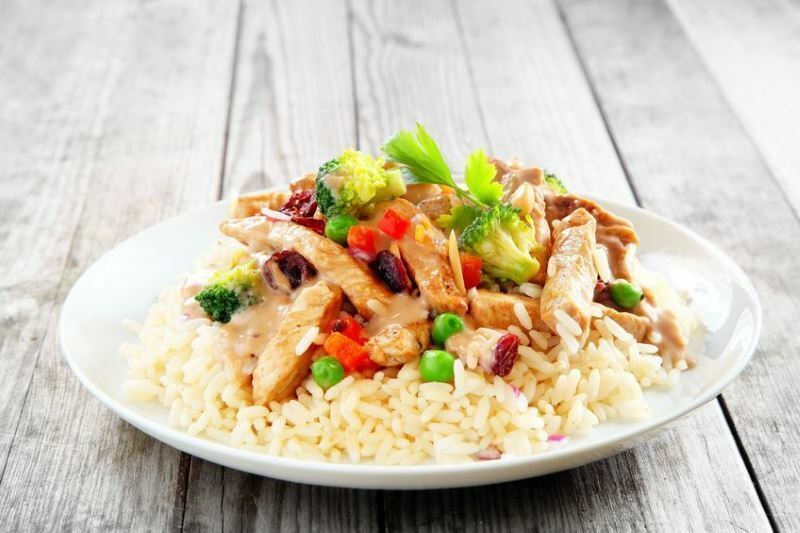 Chicken and rice is a classic meal, and it pretty much never fails to disappoint. It’s hardly a complex meal originally, and yet, this recipe manages to make it even easier by tossing it all in the electric skillet. Simply cook the chicken, add water, vegetables, rice, and seasonings, and cook until done! This would be the perfect weeknight dinner. Some of our favorite go-to recipes are basic staples like chicken and potatoes. It’s always satisfying and filling! This is a multi-step recipe, but it’s also a one-pot meal, which is a bonus! You’ll be cooking the potatoes, then emptying the skillet and cooking the chicken. Empty the skillet again and add the potatoes back in with some green beans. Finally, return the chicken until the green beans are cooked! Though it’s a few steps, it certainly seems easy enough. 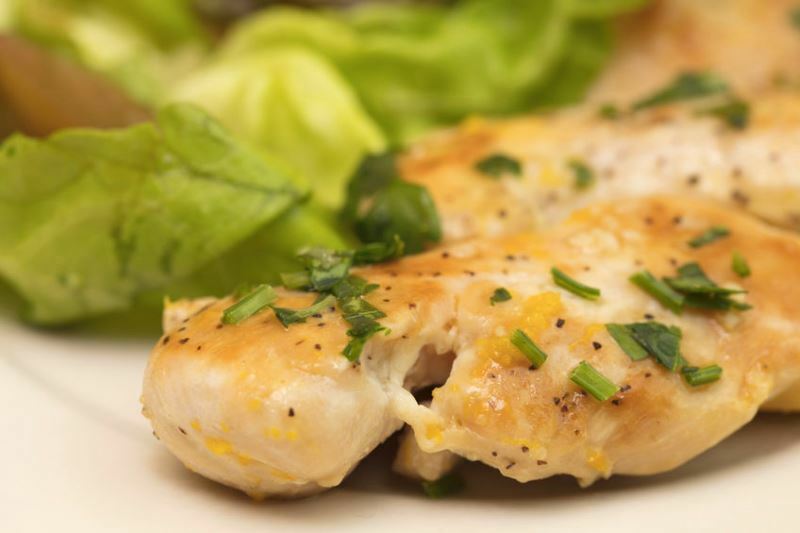 Honey mustard is bursting with flavor and can turn nearly any bland meal into a robust delight. That’s the case with this recipe! You’ll be making your very own honey mustard sauce and if you haven’t made one before, it’s definitely easier than you probably imagine. 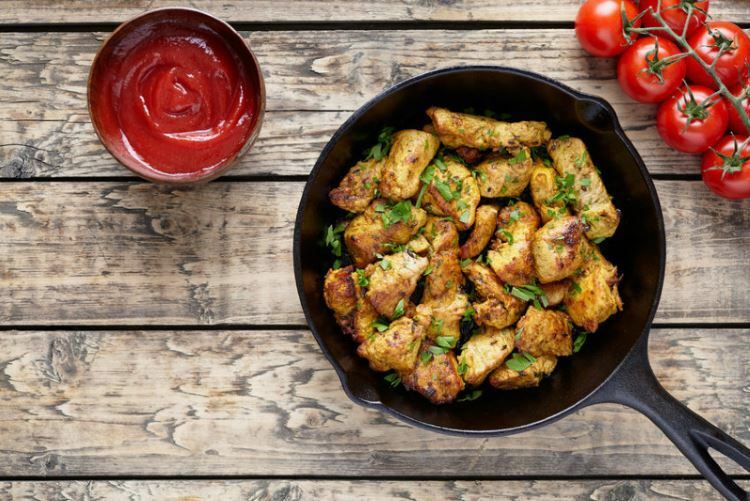 With this recipe, you’ll have evenly coated chicken topped with onion pieces for extra flavor. The previous fried chicken recipe was specifically for chicken legs, but this is all about regular fried chicken pieces. Though the recipe calls for “cut-up whole chicken,” we’d like to interpret that to mean chicken thighs or chicken breasts are perfectly acceptable. Heat oil in your electric skillet, dredge the chicken in a paprika and flour mixture and fry to your heart’s content until they are golden brown. In a small bowl, sift together the flour, parsley, oregano, garlic salt, salt and pepper. In a separate bowl, whisk the eggs, buttermilk, lemon juice and lemon zest together. Coat the chicken pieces with the flour mixture. Next, dip the chicken into the egg mixture and once again into the flour mixture. Place on a sheet pan, making sure the pieces are spread out and not touching. Refrigerate for at least 1 hour. Add enough oil to reach a depth of 1/2 inch in the skillet. It should reach about half-way up the chicken. Heat to 375°F. Fry the chicken for 10 minutes per side. Fry in 2 or more batches so that you do not crowd the pan, causing the oil to cool. The chicken should be a nice golden brown color. Depending on the size of the chicken pieces, they may already be cooked through at this point. The internal temperature of the chicken needs to reach 165°F. If not, reduce the heat in the electric skillet to 350°F. Continue cooking chicken with the lid off until done. Check every few minutes. You can drain the chicken on a wire rack with paper towel underneath it. Let cool & drip for 5-10 minutes. Serve. Do you enjoy fried chicken, but you’d prefer to cook it with less oil? 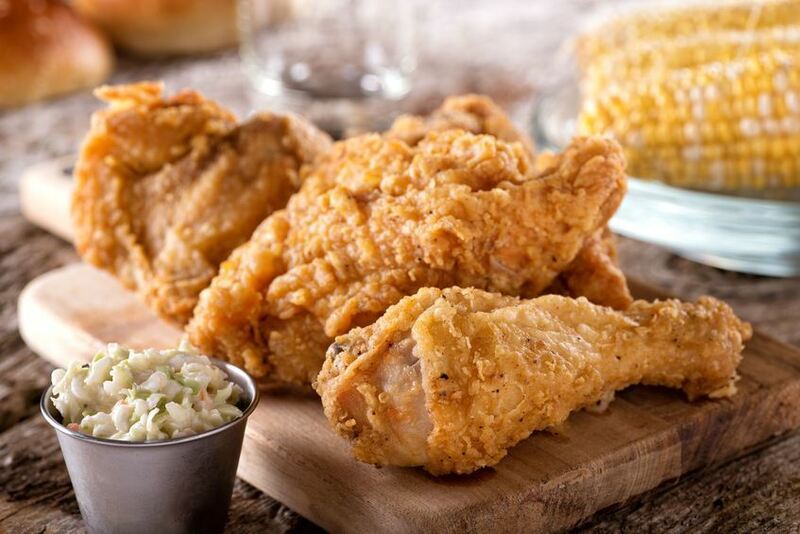 As tasty as it is, fried chicken is never considered healthy, but you can make it a little better by reducing the oil! This recipe helps with just that, by calling for less oil, which in turn can help your chicken end up more crispy. Additionally, it suggests marinating your chicken overnight in buttermilk to help with the coating. As nice as it is to not have to marinate, sometimes, marinating is unavoidable. 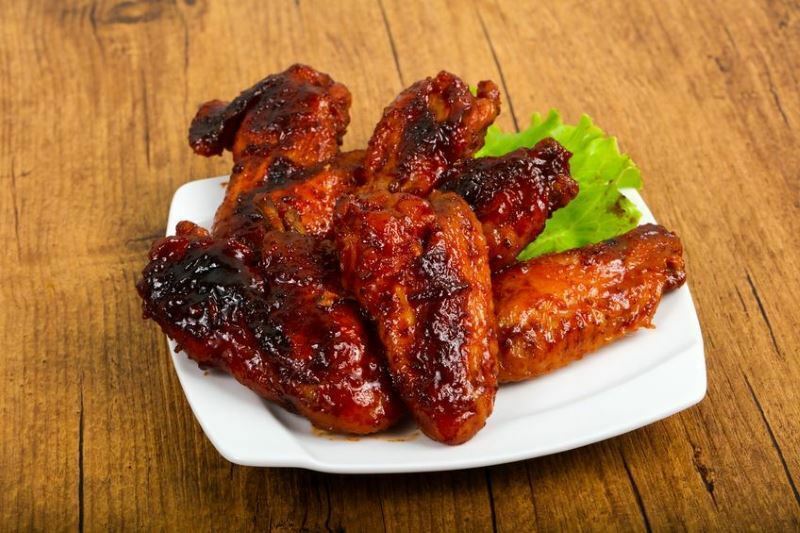 Marinating can give your chicken the perfect coating and flavor that simply can’t be achieved otherwise. 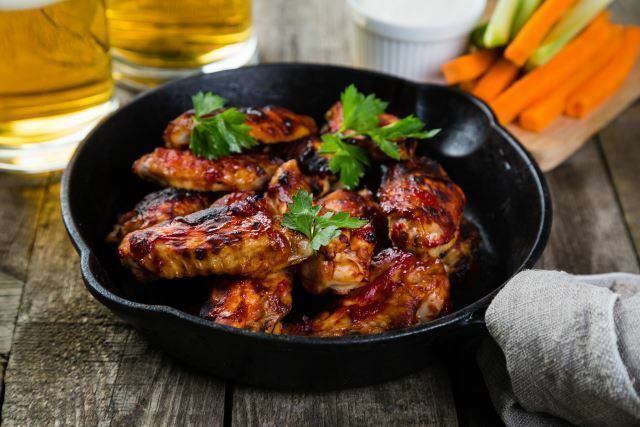 With this recipe, you’ll be marinating your chicken wings overnight in a mixture of pineapple juice, soy sauce, garlic, and more, before cooking them in your covered electric skillet for a perfectly thick glaze. 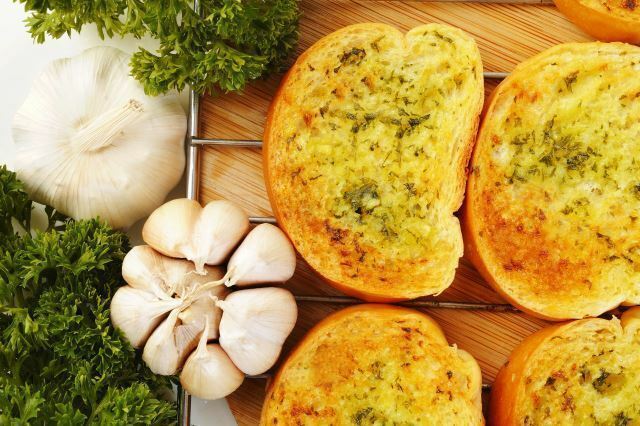 If you’re a garlic lover, then this recipe is for you! With the combination of a garlic seasoning rub, as well as cloves of black or roasted garlic, you certainly won’t need to worry about vampires in the slightest at your house! The seasoned chicken is fried in the skillet and then removed for the addition of broth and more garlic seasonings to flavor. Finally, the chicken is added back in while the liquid thickens to a sauce before serving. Is the weather getting warmer and you’re starting to crave light, citrusy dishes? This particular recipe packs a punch with a lime and orange marinade! To start, puree the marinade ingredients in a food processor and reserve a bit. Coat the chicken in the remaining marinade and chill for at least two hours. At that point, fry your chicken in your preheated skillet, and serve with the reserved marinade! We had never really thought about grilling cheeseburgers in an electric skillet, but it honestly makes so much sense! 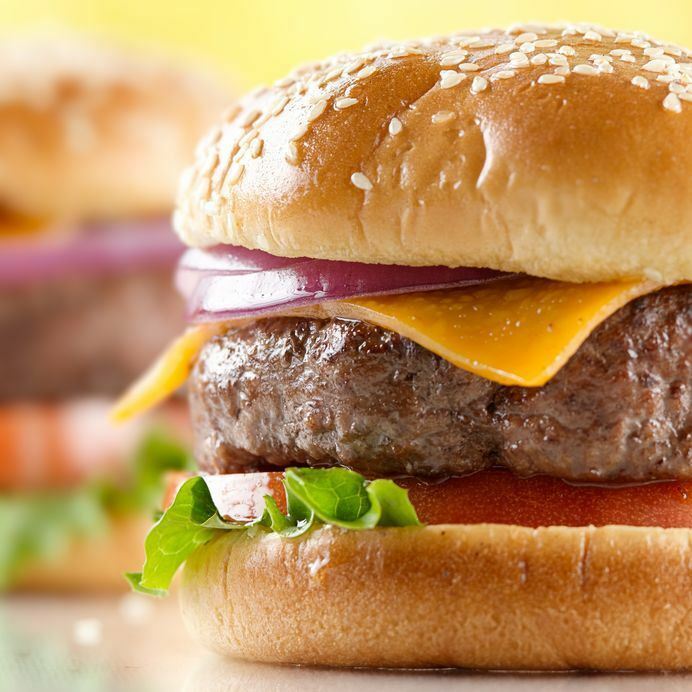 If you can grill and cook other meats, why not a cheeseburger patty? This would be a great option if you don’t have a grill or just don’t feel like grilling outdoors. Further, the electric frying pan may be a great alternative anyway due to how evenly it cooks! For this recipe, it will walk you through making your own patties with ground beef and seasonings. The pictures do a wonderful job demonstrating how they cook within the skillet and what to look for when they are done. If you enjoy Swiss Steak, then this recipe for the electric skillet is perfect for you! It’s simple and cooks on its own for a few hours without effort. The key with Swiss Steak is to cook it low and slow, which is where the skillet fits the bill. Since these skillets hold temperature so well, you can brown the meat and then add in the rest of the ingredients and leave it to simmer for a few hours without worries. If you haven’t considered cooking chuck roast in your skillet, then you should definitely check this out! Slow cooking your chuck roast doesn’t take as long in the skillet as it does in the oven, so this could be a great option for when you are short on time. This recipe begins by searing the meat on the highest setting and then adding in some coconut oil for a nice bread-dipping sauce later on. Once it’s seared, you’ll remove it, saute your veggies, add some sauce, and then return the roast and cover it to slow cook! 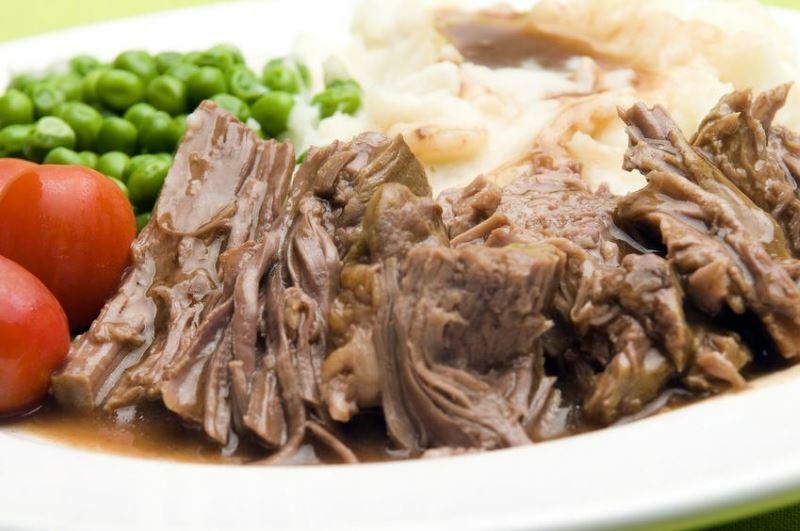 Pot roast is such a classic dinner, you can’t go wrong with trying it in your electric skillet! For this pot roast, you’ll need to sear all the edges of the roast again, but this works out really well in the electric frying pan since the sides can help hold it up. This is especially true if your skillet is deep-dish! After applying a rub and searing it, you’ll toss in some veggies and broth and let it cook. Make a dry rub by combining the salt, paprika, thyme, garlic powder and peppers. Rub it all over the roast. Add oil to electric skillet and heat to 400°F. Brown the roast on all sides. Add the onion and celery to the skillet and cook until softened (approx. 5 minutes). Add the beef broth, worcestershire, bay leaves, carrots and potatoes to the skillet. Cover the skillet. Bring to a boil. Then reduce the temperature to 200°F and simmer for 2 ½ to 3 hours. Keep an eye on the water level, adding more if it runs low. This Swiss Steak recipe is somewhat less time consuming than the one above, which could be a great option if you don’t have the time to let it cook ahead for several hours. 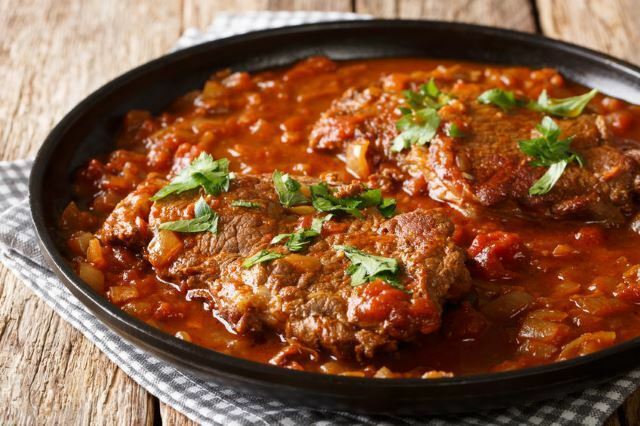 With this Swiss Steak, you’ll dredge the meat in flour, fry it up in the skillet, and then add your sauce and other ingredients to let it simmer and flavor for about an hour. Perhaps more uncommon for electric skillets are stews. 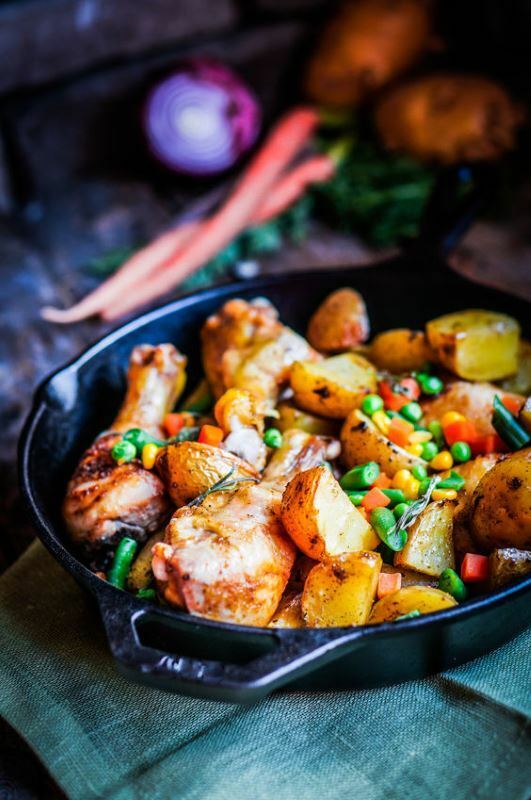 If you have considered making a stew in your skillet already, then you are probably one of few, because the skillet just naturally seems more like a tool used to cook meat. Still, it’s an excellent option for stews, especially with the deep sides to keep it all contained. 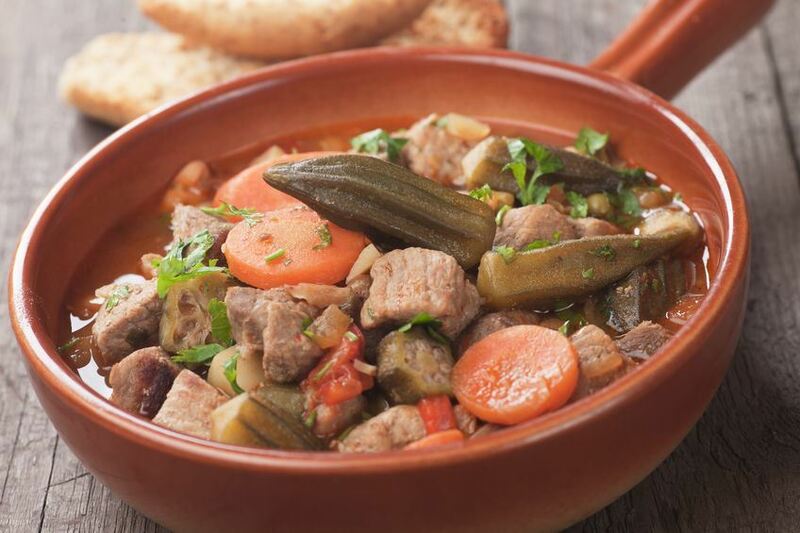 This particular stew takes hardly any time at all to prepare and cook, making it a great choice for busy nights when you want something hearty. 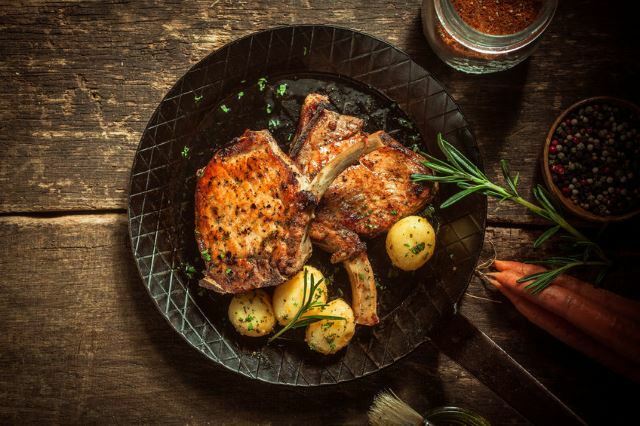 This pork chop recipe not only results in delicious meat but also calls for a variety of savory vegetables for a well-rounded meal. As a one-pot recipe, cleanup is a breeze! Just fry your pork chops until brown on both sides, then add your broth and vegetables to simmer. If you are looking for comfort-food recipes, this could be a wonderful choice! 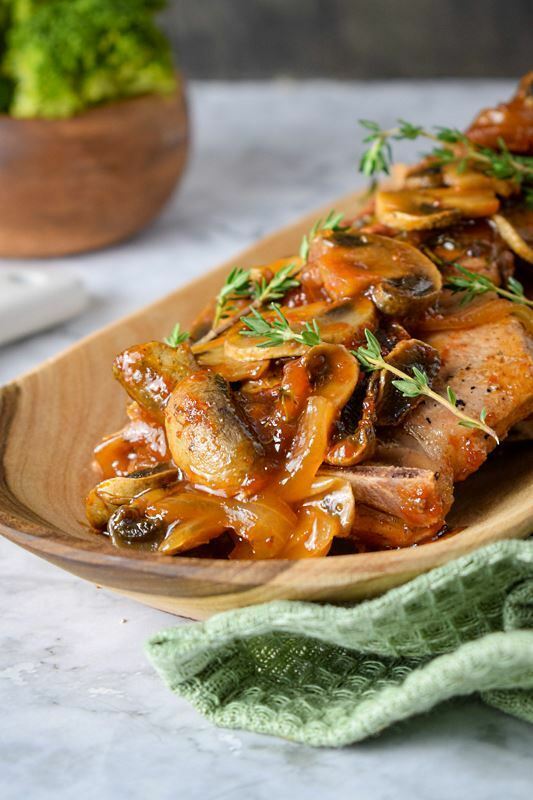 With a mix of onions, mushrooms and a beer-based sauce, this is bound to create a mouth-watering aroma. This recipe begins with browning the pork chops, and adding the vegetables and seasonings. Once the sauce is added, all you have to do is lower the heat until they are cooked through. There is one more step for thickening the gravy, but that’s about it! Mix ketchup, beer and sugar in a small bowl. Reserve. Turn on the electric skillet to high heat (400°F); brown chops on both sides. This is optional, but I like to brush 1 tablespoon of cooking oil onto the skillet prior to frying. Add garlic, onion, mushrooms, bay leaves and thyme. Cook 2-3 min. Pour the beer mix over the pork chops and cover. Reduce the heat to 250°F and cook for 35 minutes. In a small bowl, stir cornstarch and water until well blended; pour into sauce in the electrical skillet. Stir. Cover and cook for 5 minutes or until thickened. Serve with fresh thyme over rice or on its own. Do you enjoy okra? Some people do, some don’t, but if you do, then this recipe certainly merits your consideration! The flavors are practically bursting in this dish with the combination of tomatoes, okra, bacon, and onion. Within your electric skillet, you’ll be frying up bacon, then removing it and keeping the grease in the skillet. You’ll then cook your onion, tomatoes, and okra until tender. This could also be a great option if you are looking for meals for two! What could be better than hash browns, bacon, and eggs? 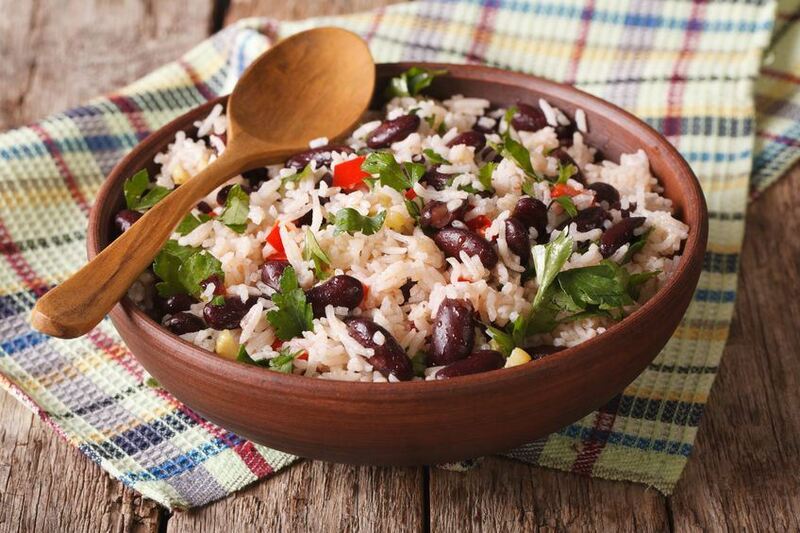 This recipe has even more delicious ingredients, but those three already have us sold! With your electric skillet, you’ll begin by frying the bacon with chopped onions. After that, you’ll add the hash browns. When they have cooked for a bit, you can crack the eggs directly over the hash browns, and cook until they are set. Top with cheese and you’re ready to serve! 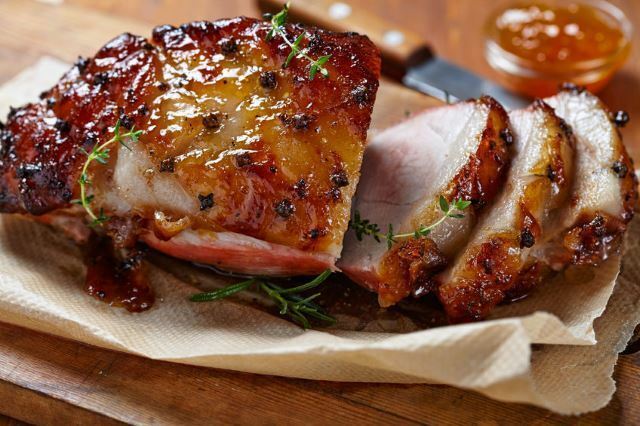 If you can make beef roasts in the electric skillet, you can surely cook a pork loin roast as well! Again, this is the perfect choice for when you need a roast, but the hot weather makes you reluctant to heat the oven. Just as with the other roasts, it’s pretty important to sear all the edges over high heat in your skillet. The other ingredients should be mixed together in a saucepan and brought to a boil while the roast is being seared. You’ll then pour the sauce over the roast, and let it simmer for a couple hours until tender! 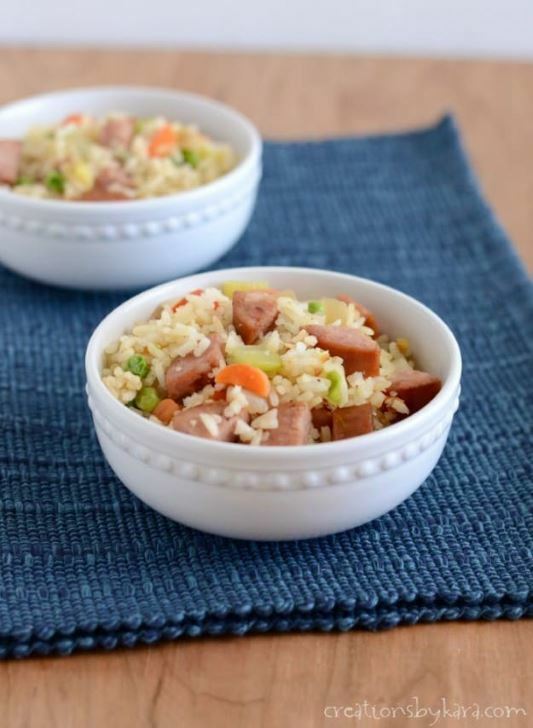 Sausage and rice always create such a delectable flavor when mixed together, which is why this recipe looks so fantastic. 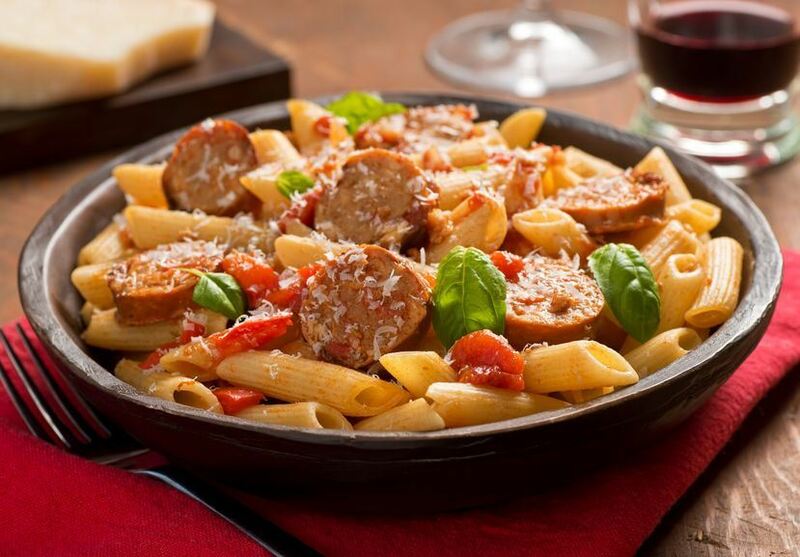 The meal is quick and easy: add the sausage and veggies to a skillet with oil, frying until they are tender. Add in the beaten eggs, cooking until set, and then toss in the cooked rice. 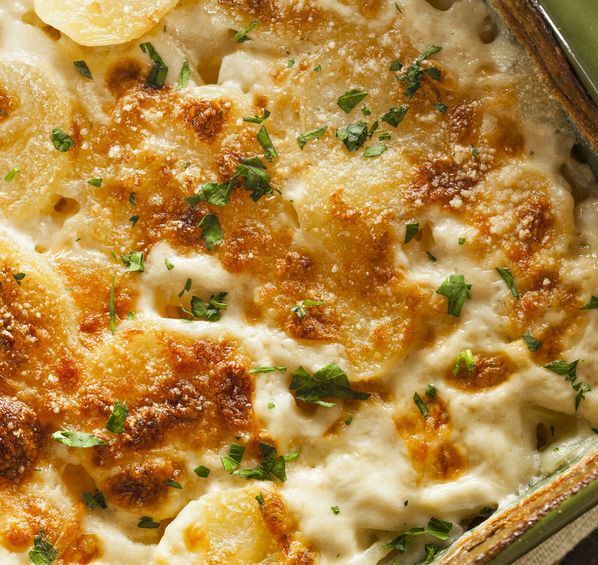 Cheesy potatoes are one of the best comfort foods. Electric skillets can be helpful for cooking sliced potatoes since you may fit a greater amount in the skillet than on the stove. However, since it’s such a direct heat, you’ll want to keep the temperature as low as possible to prevent the potatoes on the very bottom from burning. After thirty or so minutes, they should be tender and ready to eat. 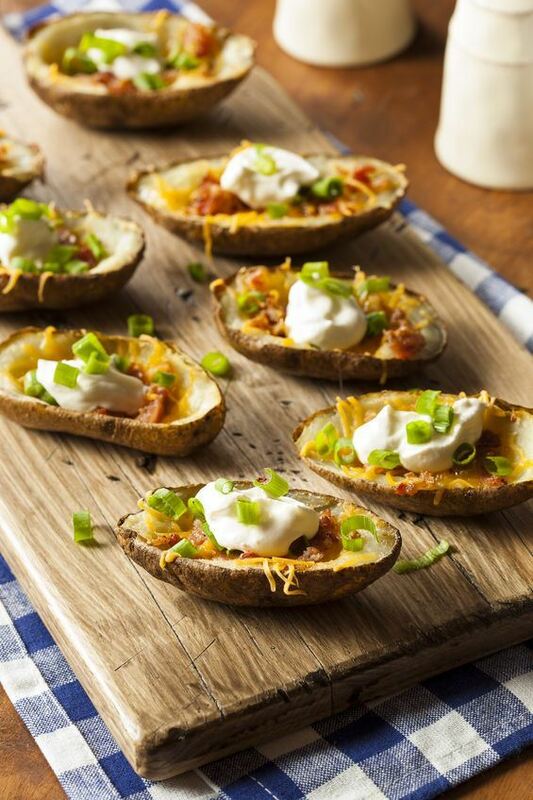 Do you enjoy potato skins as restaurant appetizers? Perhaps you’ve found yourself grabbing them from the frozen section at the grocery store. Now that you have an electric skillet, you can make them from scratch at home! Simply bake your potatoes, scoop out the pulp, and fry the skins in hot oil in your skillet! Top them with cheese and bacon and broil until melted. 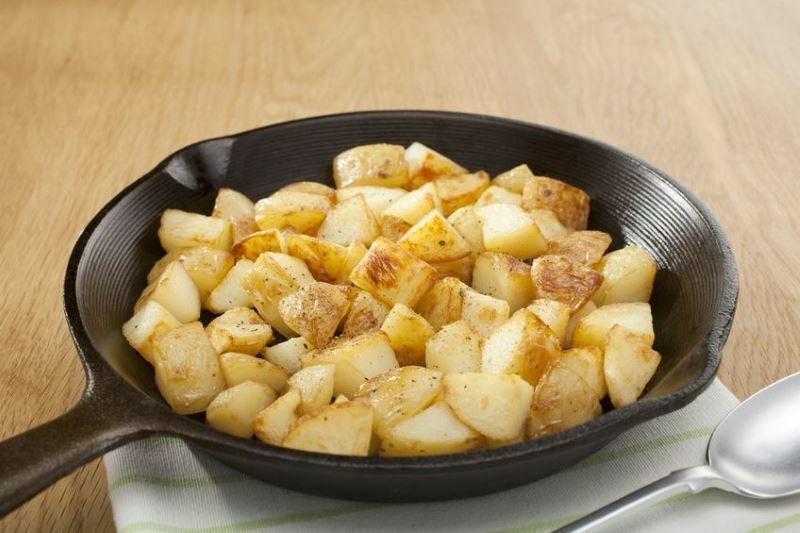 If you’ve been craving homestyle potatoes, you can easily fry them in your skillet! This recipe combines fried potatoes, peppers, and onions for a hearty and satisfying flavor. For this meal, you’ll boil potato cubes until tender while sauteing your peppers and onions in the skillet. Next, you’ll add the potatoes to the skillet to fry until they are crispy and browned. 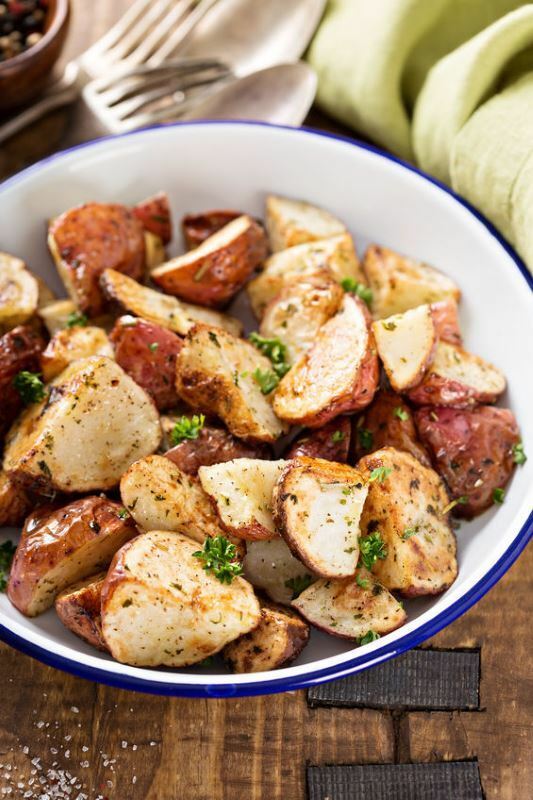 Roasted potatoes are a classic side dish, and always a hit with guests. While you can roast them in the oven, you can also roast them in the electric frying pan to conserve heat and energy. 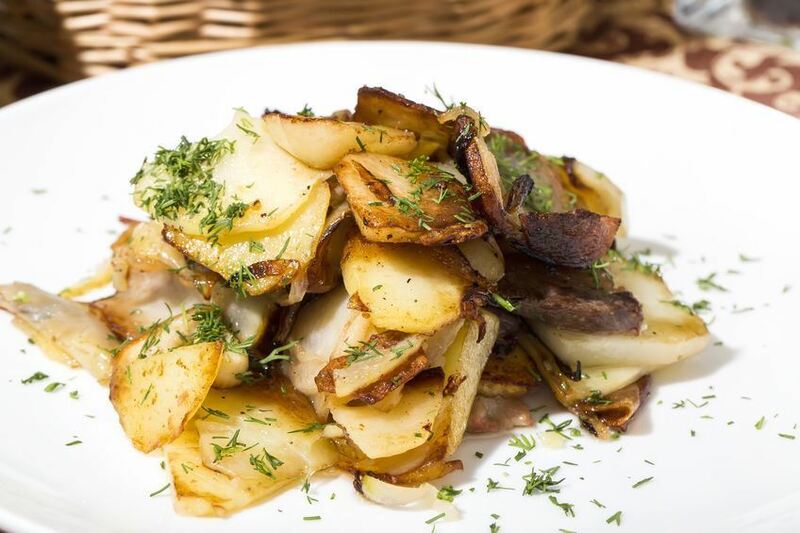 With this recipe, not only are the potatoes roasted, but they don’t become dry either due to the addition of chicken broth in the skillet. This could likely help prevent them from burning! Scalloped potatoes are delicious and the electric skillet can make it super easy to monitor their cooking progress! This recipe calls for combining sliced potatoes with seasonings and onions in the skillet to simmer until tender. At that point you’ll toss in the cheese, and continue cooking for 5 minutes and then finish with a sprinkling of parsley. That's some cheesy potato goodness right there! Melt the butter in electric skillet over medium heat (300°F). Add onions and cook until lightly browned. Add the olive oil and arrange the potato slices across the bottom of the skillet in a single layer, seasoned with salt and pepper to taste. Cook without stirring for 5 minutes, or until the potatoes have begun to brown on the bottom. Add water and cook over medium low heat (250°F) for 40 min or until soft. Sprinkle potatoes with cheese, turn the potatoes, and continue cooking 5 minutes, or until melted. Turn off the heat and sprinkle the parsley over the potatoes. Serve. 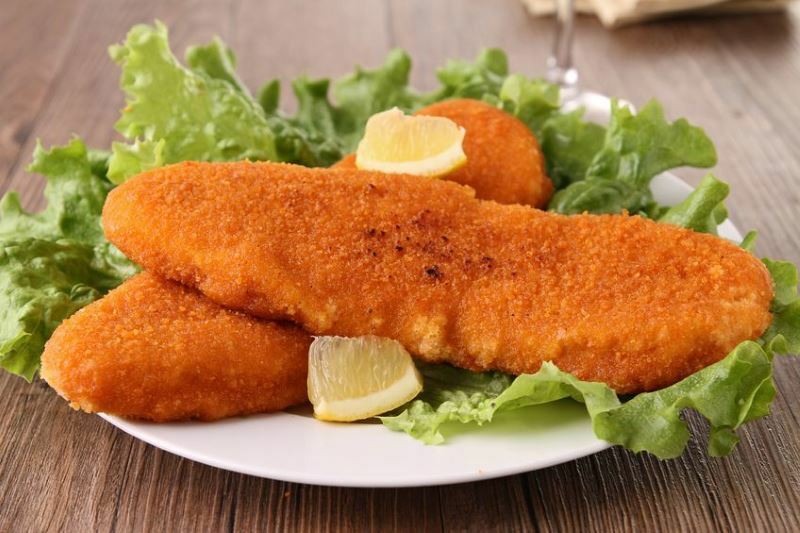 If you are just looking for a basic, go-to recipe for crispy fried fish, this recipe may be a great option for you! This is particularly perfect for a fairly mild fish such as sole, tilapia, and catfish. Simply heat oil in your skillet, dredge your filets in the prepared cornmeal mixture, and fry in the oil until golden brown on both sides. 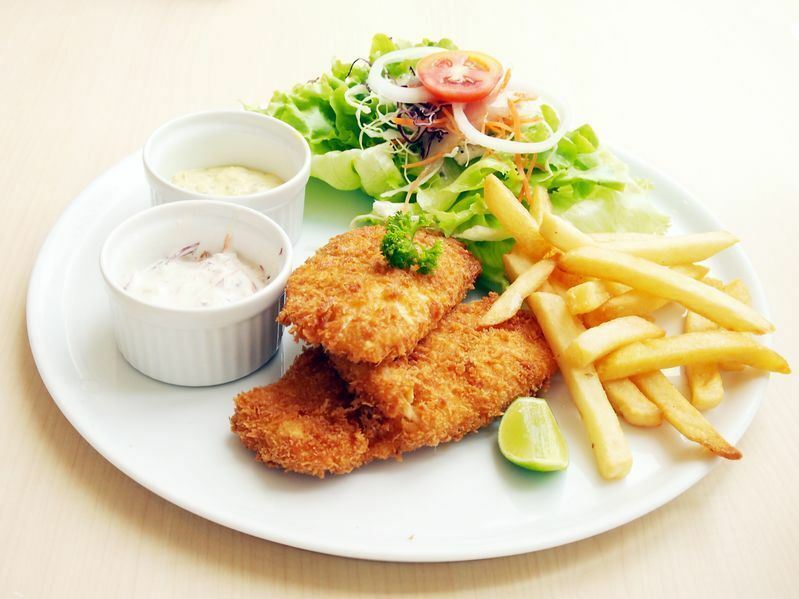 This crispy fried fish recipe is very similar and just as simple! Instead of a cornmeal mixture, the breading is mere crushed saltine crackers. Simply heat oil in your skillet, dredge the fish in egg and then the crumbs and fry it up. It’s definitely easy enough for the busiest weeknights! It can be difficult to think of filling and easy meals to make while camping. You don’t want to detract from the fun of camping by working yourself tirelessly, but camping food also creates memories with loved ones. This recipe is a perfect option for a camping meal! The combination of traditional Sloppy Joe flavors with noodles, cooked in the electric skillet combines all the elements of camping in one. Did you even go camping if you didn’t have some kind of potatoes during the trip? 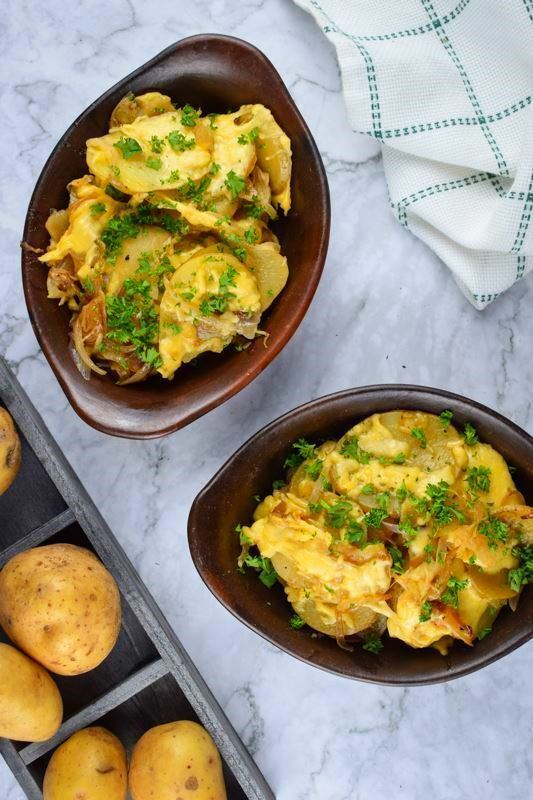 Potatoes are simply a classic addition to any meal, and while baked potatoes are typical for campers, you can easily switch it up if you bring your electric skillet along. To make it, you’ll just saute your onions, and then add the diced potatoes and seasonings, cooking until the potatoes are soft. I don’t even think it’s possible to go camping without having mac & cheese at some point! When you’re out camping, you’ll have a limited number of pots and pans, which is why your electric skillet could come in so handy for this! 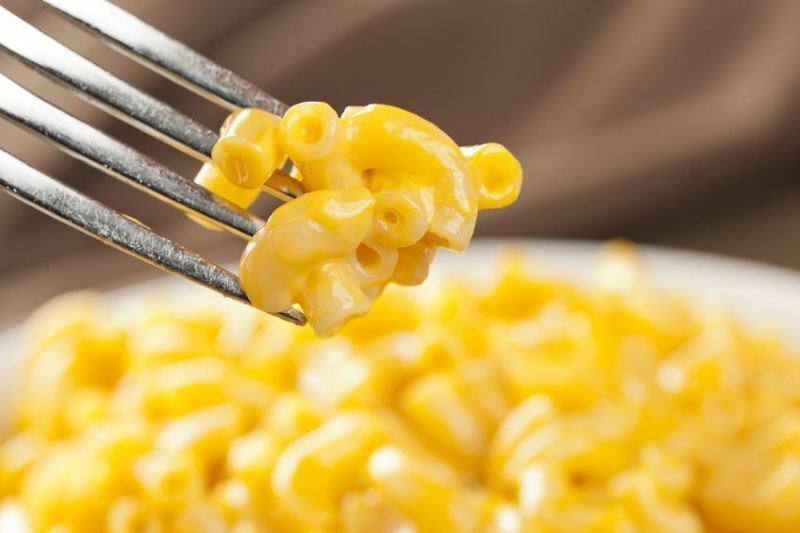 Simply boil the water in your skillet, as usual, cook the macaroni, and proceed to make it as directed from the box! 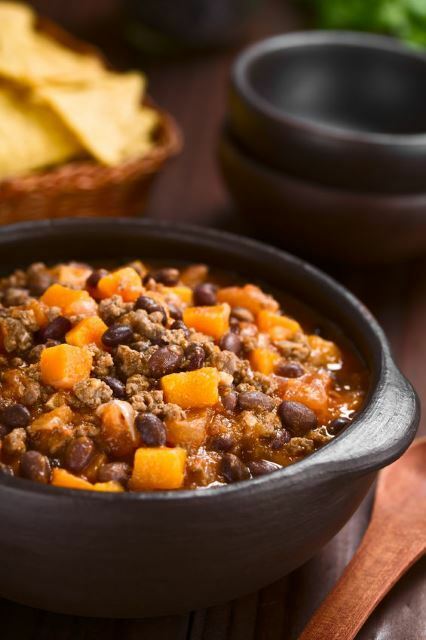 If you thought chili could only be made in a pot, think again! 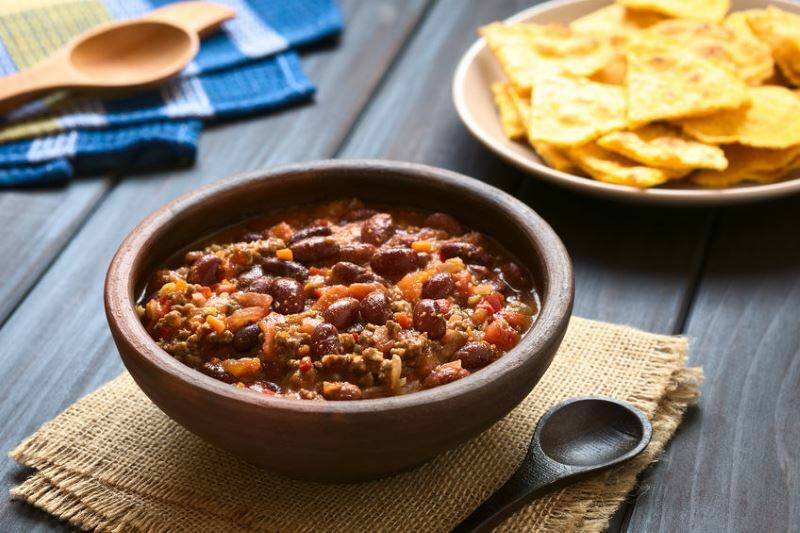 It can be hard to find the room to bring a big pot when you’re out camping, but chili is traditional camping food. How to make up for it? Your electric frying pan can totally handle the job! It’s as easy as browning your ground beef and then adding in your seasonings and the rest of your ingredients to simmer for at least thirty minutes. Our only suggestion would be to plan ahead for the size of your particular electric skillet. The term “hot mess” is rather ambiguous when it comes to a recipe, but that’s honestly the perfect term to describe this dish! 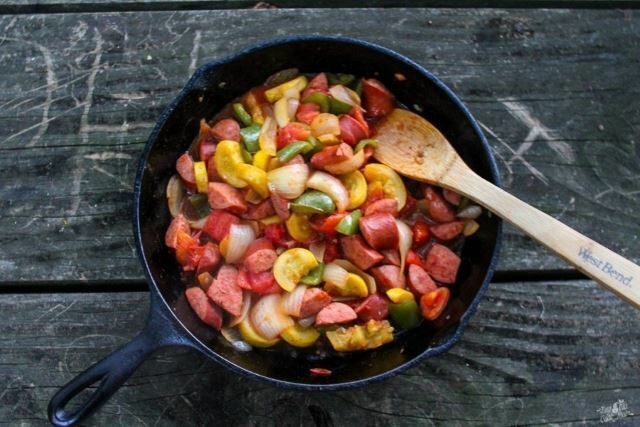 It’s a hot mess because it’s just a mix of various vegetables and kielbasa fried up in your skillet. I can’t think of much better for a dinner under the stars on your camping trip. This recipe calls for fresh vegetables such as squash, tomatoes, bell peppers, and onions for a delightful cacophony of flavors! When it comes to cooking meals in electric skillets, the options are fairly endless. If you usually cook the meal on the stove, there’s a high chance you can cook it in your skillet. Typically need the oven to bake it? Give it a shot in your skillet. You’ll never know until you try it and you’ll be surprised how many recipes can be easily prepared in the electric skillet. Did you like this list of recipes? Let us know what you think, perhaps if you have a favorite out of the list, or what meal you’re now dying to make in your skillet. If you liked this article, please share it with your friends and family!